At Taylor’s Opticians Frodsham, we’re always looking out for innovative products that can help you and your family achieve the best vision and comfort with your new spectacles and contact lenses. We take great pride in what we offer to our patients, including a wide range of bespoke spectacles and contact lenses tailor made to your specific needs. We know that no two eyes are the same so why settle for second best? 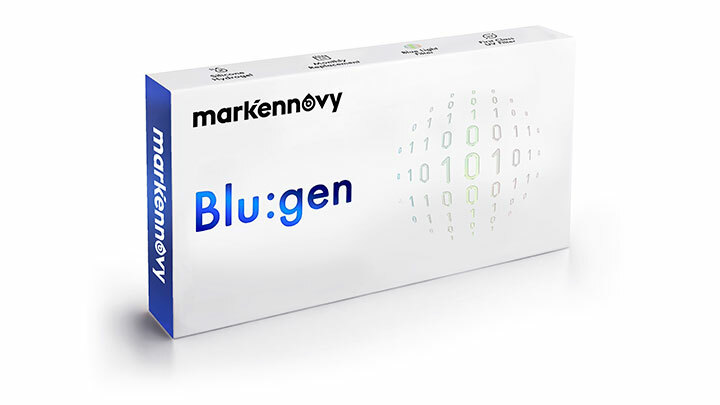 Blu:gen from Mark Ennovy. Mark Ennovy shares Taylor’s Opticians values and is dedicated to innovation and a forward-thinking approach towards the evolution of contact lenses. Mark Ennovy has one of the most versatile product portfolios in the world, with an unrivalled combination of materials, parameters and geometries for the most complex of eyes. Blu:gen Contact Lenses available in 5.3 billion parameters! Blu:gen contact lenses are designed to protect you from harmful UV with the added benefit of a selective blue light blocking filter. Constant exposure to digital devices may lead to poor sleep, and can also contribute to digital eye strain. The unique selective blue light blocking filter of Blu:gen contact lenses helps to improve the contrast of digital devices, and may improve the sleep pattern of those who suffer from digital eyestrain. This combined with its first class UV filter offer the maximum protection found in a contact lens yet. This innovative contact lens is a super breathable silicone hydrogel monthly disposable contact lens which is available for short sight, long sight, astigmatism and multifocal prescriptions. Each lens is individually designed for your eye so that you will always achieve the best fit, comfort and vision, in fact it has 5.3 billion parameters available! Want to see the world in a new light? Call 01928 732255 for your FREE Blu:gen contact lens consultation.